Otis Place Will Get 8 New Trees This Planting Season | Park View, D.C.
Area on Otis Place where trees will be planted. I’m happy to report that the south side of Otis Place next to the school will get eight new trees this year. If you walk down the street, look for the orange dots on the curb which indicate where the trees will be planted. I don’t know what species of trees will be planted yet, though the DDOT arborist did meet with the school to discuss this topic at the end of last week. 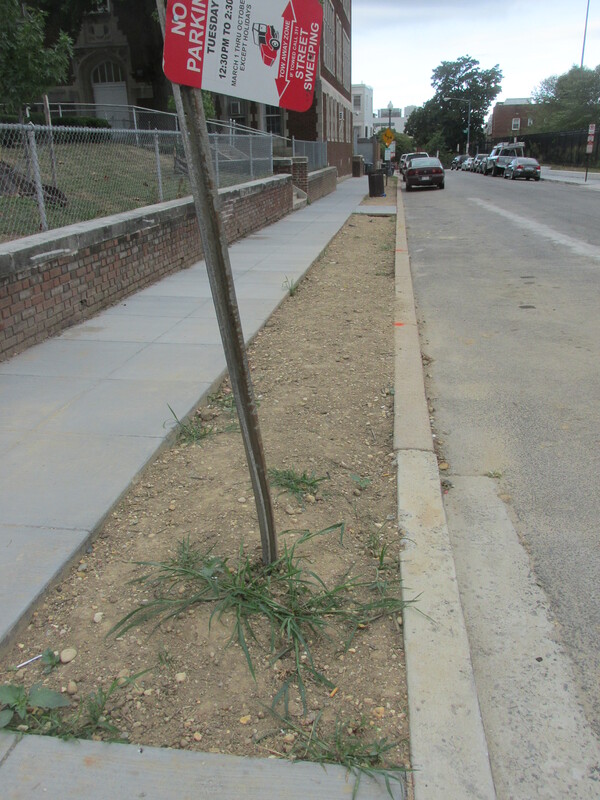 The ability to start planting trees on this section of Otis Place was a result of an on site meeting I had with DDOT at the end of June and advocated for moving the sidewalk away from the street to create a new tree box. I’m hopeful that I can collaborate with DDOT in the next fiscal year to do the same on the north side of Otis Place. Overall, Park View will not be getting many new trees in the 2015/2016 planting season as nearly all of our tree boxes are full. In order to tree up our treeless areas, we need to either find solutions such as the one on Otis Place, or make trees available for private yards such as the ones on Luray, Manor, Warder, and Park Road. Below is the map showing the new trees on Otis Place with other nearby plantings in the coming season. (Map showing where new trees will be planting in the 2015/2016 season). This entry was posted on September 22, 2015 at 7:01 am and is filed under Streets and Trees. You can subscribe via RSS 2.0 feed to this post's comments. Huzzah! A terrific addition to the neighborhood. Park View is in desperate need of more more more trees! Thanks Kent for organizing! Who will water these new trees? I have seen many new trees around Tubman die because no one waters them. I wonder how Joanne Durham’s sister is doing…..
0=47Look here,,,,!my co-worker’s step-aunt makes $79 an hour on the computer. She has been out of a job for 9 months but last month her pay was $17477 just working on the computer for a few hours. `<?my roomate's sister makes $67 /hr on the computer . She has been unemployed for ten months but last month her paycheck was $21166 just working on the computer for a few hours.